One particular scene in The Winter Soldier has fans calling Steve Rogers out for being a hypocrite. Captain America may have waivered on his quest for truth and justice between The Winter Soldier and Civil War, according to a new opinion being floated on social media. Obviously, there are many ways to look at the situation, and this is just for fun, but it certainly looks like there may have been a lack of continuity in the last few installments in the Marvel Cinematic Universe. 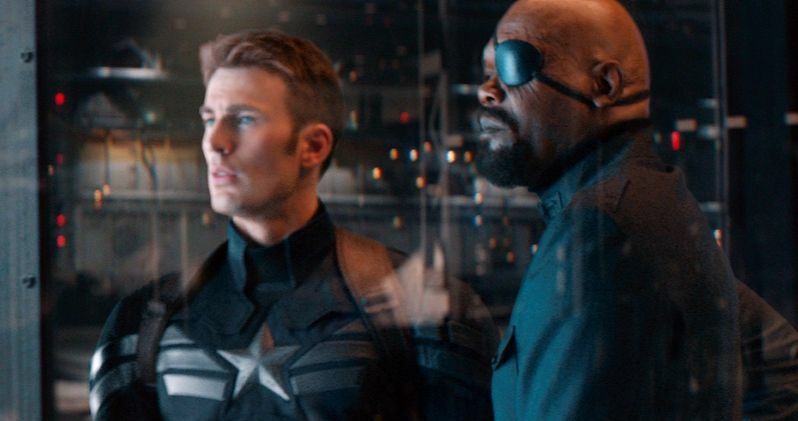 The Winter Soldier scene in question takes place when Steve Rogers is calling out Nick Fury for withholding secrets from the public and the Avengers, which led to deaths and injuries. Rogers steps on his soapbox, and it's easy to see his point. However, this is the same guy that didn't tell Tony Stark that Bucky Barnes killed his parents, which led to a pretty big blowup down the line. Obviously, it can be argued that Rogers didn't know this important chunk of news at the time he was arguing with Fury. The hypocritical stance comes later when Steve Rogers knowingly hides the truth from Tony Stark, which is the same thing that he calls out Nick Fury for. At the end of Civil War, Stark finds out, and it's not good. The wound still ran deep during Infinity War between Rogers and Stark. However, this could also just be good storytelling for the arc of Captain America. The man dedicated to truth and justice realizes that the world isn't always black and white, slowly coming around to understanding Nick Fury's motives. On the opposite end of the spectrum, Steve Rogers is bummed on Nick Fury because people lost their lives, which is understandable. By the time he learns of Bucky Barnes' actions, he's seen Tony Stark go through some issues and how he reacts to things, which isn't always in the most constructive way. The Avengers were a closer group at this time, and Rogers more than likely didn't want everything to implode when so much good was being done. With that being said, we all know how that worked out for him. We'll be waiting to see if Rogers and Stark are able to come together and work towards defeating Thanos in Avengers 4. Avengers 4 will more than likely be the end of the road for Chris Evans and Robert Downey Jr., so it's going to be interesting to see if Steve Rogers and Tony Stark are okay with each other when all is said and done. By the way things look, and from what some of the cast and crew have said about the highly anticipated movie, it doesn't seem like it's going to be wrapped up with a nice pretty bow. From what has been hinted, things are only going to get darker. You can head over to Reddit for the case against Captain America.